There is an unprecedented amount of financial chaos throughout the world today, and the turmoil will most likely continue into the foreseeable future. Just because many companies, countries, and individuals aren’t able to create a budget and stick to it doesn’t mean it’s not possible. Coming up with a budget can be tricky. Living within that budget is even trickier. However, the peace of mind you feel when you live within your means is priceless. This type of contentment comes from an increase in your freedoms. You become free to use discretionary income the way you want. You become free knowing that bills are paid in full and on time. Budgeting will allow you to save money and your finances to flourish. All it takes is a plan and the will to live below your income. Budget step one: Where is the money going? The first place to start when coming up with a budget involves finding out where your money is currently going. This can be a little uncomfortable in the beginning. If you don’t already keep your receipts, now is the time to start. Look at the past two or three months to get a good overall picture of how much money is being spent and where it’s being spent. The obvious places are utilities, house or rental payments, home and cell phone bills, auto payments, etc. Some expenditures that require more effort to keep track of are the daily trips to the local coffee house, the salon and dining out. It’s amazing how quickly money is spent and how frequently the output is equal to or greater than one’s income. Take financial information from receipts, bank and credit card statements and put it on paper or on an electronic spreadsheet so that you can realize your spending habits. Budget step two: What is important? Regardless of the amount of money coming in, one must not spend more than one makes. The next step is to begin writing a budget. The number one item that many people skip when forming a budget is to pay themselves. Ten percent of your income is a nice place to start. This can change as necessary but allow some savings. No one knows what the future holds and everyone needs to be prepared. Rather than worrying about the worst, just be prepared for it. Saving should be a priority. What are considered necessities? Food, shelter, and transportation to work are vital. Perhaps that home phone isn’t necessary in addition to a cell phone. On the other hand, maybe you have children in your home and it’s important to keep the home phone. You must decide what is important. Realize that some expenses will need to be trimmed or cut, but don’t take away all the fun. Balance is the key. Budget step three: Will the budget balance? Now it is the time to honestly decide which expenses can be curtailed. Eating out costs a lot, as does entertainment. Movies are expensive, so try scaling back to going every other week. If eating out is a priority, enjoy a pricier restaurant just once a month. You can save a lot or spend a lot depending on your goals. If you have a goal to be financially stable, you will find it easier to achieve if you are willing to sacrifice a little now in order to have a lot later. Work until a balanced budget is achieved. Give up all but one credit card if necessary. Have paychecks deposited directly into a checking account and have bills paid automatically from that account. There are reputable companies who will help handle bill paying. Again, the final goal is freedom. 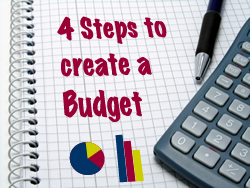 Budget step four: How do you keep track? One last suggestion involves daily expenditures. If self-control with credit cards is an issue, take out a budgeted amount of cash once a week. When the cash is gone, spending is over until the next payday. Don’t overspend at the convenience store and not have enough money for the grocery store by separating the cash into envelopes if necessary. Find a way that works for you to keep track of expenses. Financial security is within your reach. It’s all about your attitude, habits, and ability to see the big picture. Create a budget and stick to it. It will get easier as time goes by, especially when you begin to see your debt recede and your money market account grow. Enjoy life by not feeling like your head is just above water. Live a contented life by taking charge of one thing in life you can control—your own spending. Thank you so much for all the great tips. My Hubs does our budgeting and does a great job at it. Yeah, my mom does that with her receipts: stuff them into envelopes. We also do this, and it saves us a lot of money!